The sense of distance formed in that center, which is only a few inches in size, on the other hand, is a great miracle created by God. Within such images created in such a small area, God also creates a sense of distance, perceived as if one's destination were miles away. Someone looking at the ocean from a plane window actually watches it in his brain from the plane in his mind. The distance between the two, on the other hand, is a perception God creates in the human being who lives within his brain. Who does perceive these sensations, then? The answer to this question, which materialists cannot answer, is the soul God creates. It is our soul that experiences all these sensations. You must also have a better understanding of this glorious and unprecedented artistry, this infinite wisdom in God's creation and draw the appropriate conclusions from this miracle of creation. If someone asks you how far away the TV set is when you are watching the late-night news, you will most probably answer, "A few feet." Yet, that answer is far from accurate. That is because the TV set is not "a few feet" away from you at all, but is in the sensory center in your brain. 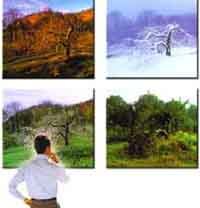 What you see is not the television out there but an image formed in the visual center in your brain. The signal reaching you by means of light from the external world is transformed into electrical signals by your cells, and these signals reaching the brain are perceived as an image. This fact is a great miracle created by God. In a tiny space made up of flesh, lipids and proteins, God creates a colorful, bright image that gives a true sense of depth. This is an image of perfect quality and sharpness that has no blurriness, darkness or shift. Furthermore, in another tiny spot in that same brain, God creates high-quality, multi-dimensional sound with no distortion that accompanies this image perfectly and is totally synchronized with it. It is a scientific fact that everyone actually lives in a small room in his skull, in a tiny part of his brain. No one, no matter how much he strives, can ever step out of that room in his brain. He can never reach the original of the world that occurs in his brain. This scientific fact is very important in the sense that it indicates the glorious and unprecedented creation of God. 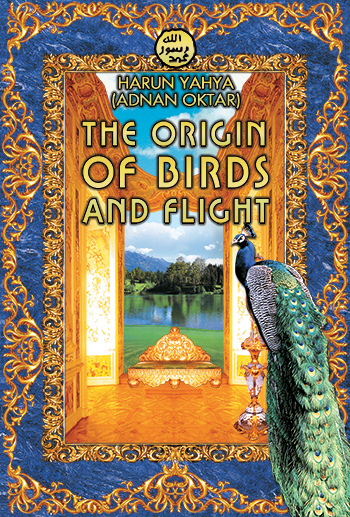 From the Prophet Adam on, God has created separate lives in the brains of all the people that have ever appeared on Earth, showed colorful, bright images providing a sense of distance in the brains of billions of people and caused them to hear the loveliest songs, the roaring of a waterfall, thunder or the buzzing of a bee. More strikingly, God created all such perceptions with such delicate harmony and perfection that the majority of these people never realized that they actually heard the sounds or watched the images in their brains. They always assumed that they saw the actual things that existed in the outside world, talked to them or touched them. We can never reach the original object. We can only experience what we see in our brains. Who Is It That Watches A Bright World, Hears Birds Singing Or Smells A Rose? Stimuli coming from the ears, eyes and nose reach the brain in the form of electrical signals. Who is it in the brain that experiences these electric signals as sound, smell and sensation? Inside the brain there exists a consciousness that perceives all these without having any need for eyes, ear or nose. To whom does this consciousness belong? Darwinist-materialists, who believe that nothing exists except matter, cannot answer these questions. Never forget that it is in your power to destroy the basic claims of Darwinist-materialist ideology. The 21st century will be the century when all these facts will be grasped and accepted. There is one fact everyone knows: The senses of sight, sound, smell and taste are perceived in the brain. That is, we experience the outside world inside us. We spend our entire lives in that small space in our brains. 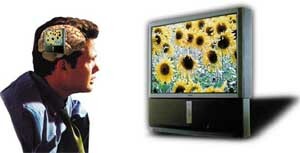 We watch the outside world on the television in our brain. We smell the electrical signals entering our brains from the external world in our sensory centers. We again perceive the electrical signals entering our brains from the external world as hardness. The electrical signals entering our brains are transformed into sounds in the loudspeakers in our brains. We experience all these sensations in that room of a few cubic inches in our brains, and all through our lives we can never step out of it. No individual, not someone traveling from one continent to another, nor the first man who walked on the moon, nor a farmer who has never left his village in his life can go anywhere outside the small room in his brain. We see oceans, woods, the sky, the Sun, the Moon, flowers and fruits, which do exist in the external world, in this small room in our brain. We smell them there and hear the sounds they produce in that room, without ever making direct contact with their originals outside … Inside the brain there is a consciousness perceiving all these sensations. However, that conscious certainly does not belong to the nerve cells or lipids making up the brain. This consciousness is the soul God creates. Every individual who reads this obvious fact must ponder on God, the Exalted, Who places the entire universe with all its colors in a pitch-dark space of a few cubic inches in the brain, fear Him and take refuge in Him. The entire life of a human being is made up of the perceptions in his brain revealed to him through his five senses. For instance, a person walking on the street actually walks on the street inside his brain. His feet, the unevenness of the pavement, the sloping road, the discomfort his shoes cause him, the height of the curbstones, the wind and all the cars passing by are seen and sensed in the brain. A person who rubs his eye because of an irritating dust particle in it will grasp this reality. When he rubs his eye, he sees the image of the road, trees and cars moving up and down. This is similar to the shifting of images on the television. That system also exists in the brain. In this sense, a person is similar to someone watching television. In the same way that he watches television programs, he also watches what is provided for him, through his senses, in his brain. This being the case, who is it that sees these images in his brain or feels the cold wind on his face? God informs us that it is the SOUL that perceives these sensations. 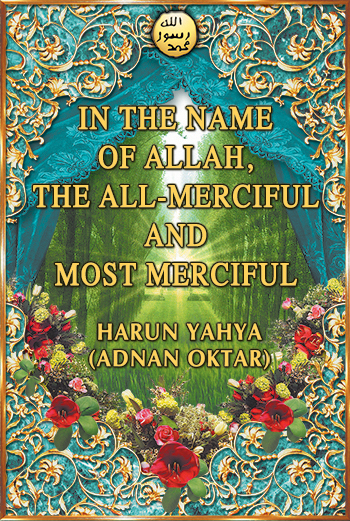 What we call "our life" is actually what our Lord shows our soul in accordance with the destiny He creates for us. 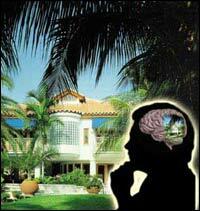 WHO IS IT THAT WATCHES THE IMAGE OF A HOUSE FORMED IN HIS BRAIN? 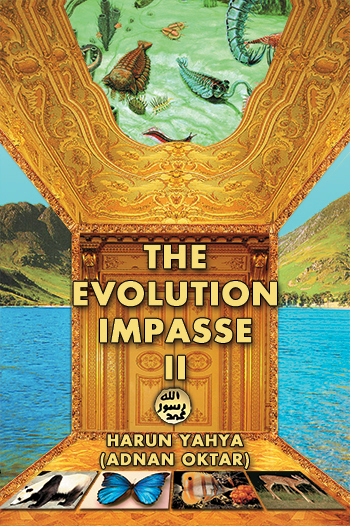 The question that most bothers Darwinist-materialists is; "Who is it that SEES the three dimensional, bright image that is formed in the brain?" As we know, everything we see is an image formed by electrical signals reaching our brains. Stimuli entering from the eye reach the visual center in the brain, and the brain forms a three dimensional, colorful image conveying a flawless sense of dimension. 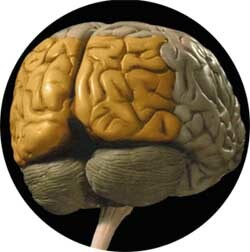 Books on biology, physiology and biochemistry give a detailed account of how this image is formed in the brain. However, you will be unable to find the most important fact about this issue anywhere: The image is formed in the brain. But, who is it that watches the image formed there? An image without an audience is of no use. So, where is this audience located in the body? No one has so far encountered a being in the brain that watches this image. The one who watches the image in the brain is not a being made up of flesh and bone. It is rather man's consciousness, that is, his soul. 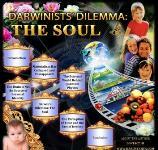 Because they do not want to accept the existence of the soul, Darwinist-materialists always avoid this question. Once the issue is raised, they strive to silence the speaker in a panic. You can try asking a Darwinist-materialist that question yourself! If someone asks you how far away a friend of yours is from you as you chat to him, you will most probably answer, "A few feet." Yet, that is not an accurate answer. 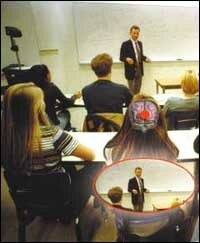 Your friend is not a few feet away at all; he is in the visual center in your brain. The direction from which you hear his sound and his three-dimensional image conveying a perfect sense of depth makes you think that he is a few feet away from you. This sensation is so strong that proving otherwise demands a lot of explanation, as is the case right now. However, what we are discussing here is not a philosophy or a system of thought. The fact that what we call "the material world" is created in the sensory centers in our brain is also verified by science today. The TV set which you think exists in the corner of your room, the music you hear, the roses you smell, your friends you enjoy being with, the ice-cream that tastes so good, in brief, everything in the outside world an image formed in your brain. Everything you assume you have witnessed alone. In some sections of society, we observe the prevalence of a distorted understanding of destiny. This distorted concept of fate holds the superstitious belief that God has determined a "destiny" for everyone, but that these destinies can sometimes be changed by people. For instance, if someone comes back from the brink of death people make superstitious statements like "He cheated fate." Yet, nobody is able to change his destiny. The reason the person who comes back from death's door does not die is because he is destined not to do so at that particular time. It is also the destiny of those people who deceive themselves by saying "I cheated fate" to say so and maintain such an erroneous mindset. All events, whether we witness them or not, occur under God's knowledge and control. 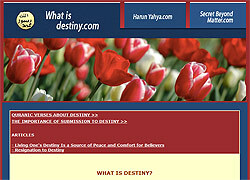 Destiny is the eternal knowledge of God, and for Him, Who knows time like a single moment and Who rules all time and space, everything is determined and done with in destiny. A region of a few cubic centimetres in the cerebral cortex is similar to a television screen collecting the stimuli coming from the optic nerves. And we, or rather our minds, watch the colours, various light combinations or the beautiful wing of a butterfly within our pitch-dark skulls on the black cerebral cortex. This is similar to watching something on a television screen. We see our entire world on this screen in our brains. Who knows what the originals of the objects we see are like? For instance, does the original of the butterfly we see on the screen in our brains, possess the same colours as the reds, blues and yellows we perceive? Or are these only the colours of the image we see in our brains? We can never know the answers to these questions. 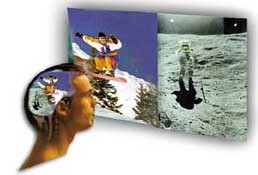 Our soul that watches these images in the brain can never step out of the brain and see the originals of these images. Consequently, the soul can never know whether the things it sees are the same as their originals. This is such a great miracle that the majority of people fail to grasp this fact, and those who do feign ignorance of it. From the moment they are born, God makes people watch a screen in their brains, makes every soul live inside a skull, a narrow, small and compact space. However, the images God makes people perceive are so magnificent, detailed and identical to their originals that they do not even notice where they really are. 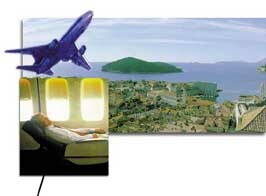 When watching copy images in their brains, and living within their skulls, people assume they are sailing by boat, flying in the sky in a jet, or covering thousands of miles. Furthermore, no matter how often they may be told, they still cannot conceive that they are, in reality, living in their skulls. This is one of the greatest miracles a person can ever come across in this world. You will see that pondering deeply over this miracle will open new horizons for you. Think for a moment about those people who are swept away by material greed: What do they value most? A fine house, luxurious things, ostentatious jewellery, the latest model car, big bank accounts, a yacht ... For this reason, such people are terrified of the fact that they are observing all the things they possess on a screen in their brains, and that they will never actually possess the originals of these things. However, this is a fact confirmed by the scientific advances in the 21st century. People live in a world of facsimiles composed in their brains, and cannot possibly have any relationship with any external world. Sound, light and smell cannot enter the skull; what enters is only electrical impulses coming from these material things. This is the situation of someone, as in the example above, who gives money for the magnificent villa shown in the background. While he thinks that he is buying the villa and counting out the money, he is really buying an impression formed in his brain, and is not giving actual money to the person in front of him, only an image of money. The person receiving the money is really receiving an impression. In other words, there is a "transaction of impressions". Have you ever thought that you can never possess the originals of the possessions you think you own? This is a scientific fact that appears even in biology and physiology textbooks. Let's assume that you have a car. You actually watch this car on a screen in your brain. When you hold the steering-wheel or drive down the highway, you are actually watching these actions on the screen in your brain. Light rays from the steering-wheel, the indicators, rear-view mirror and all the other components of the car are transformed into electrical signals in your eye and conveyed to the visual centre of the brain via the nerves. 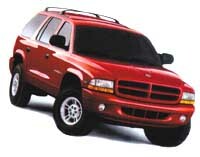 This way, an image of a car, identical to its original, is formed in your brain. But you must be cautious! YOU SEE AN IMAGE IDENTICAL TO THE ORIGINAL, YET WHICH IS NOT THE ORIGINAL. Even if you wished you could never see the original of that car. That is because, no matter what you do, the image of the car will always form in the visual centre in your brain. No matter what you do, you can never see even a single point outside the image that is formed in the visual centre in your brain. For this reason, what you possess is actually not the car itself, but a copy. In the same manner, you can only have copies of your clothes in your wardrobe, the house in which you live, your furniture and all the fortune you think you own, in your brain. Consequently, even the wealthiest man in the world does not possess the greatest fortune in the world at all, but copies of that fortune in his brain. The majority of people value their houses, factories, yachts, lands, jewellery, bank accounts and antiques very much. They devote all their lives to attaining these material goods, and work day and night to that end. Their greatest fear is of losing these things accumulated over the years with such difficulty. Never pondering the real meaning of these material goods, however, they are greatly misled. 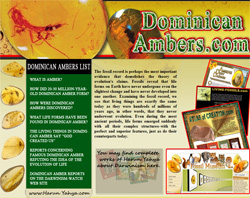 That is because they can never encounter the originals of these possessions they strive to preserve with such ambition. They can never live in their actual houses, sail on their actual yachts and can never wear their actual jewellery. They can only watch the electrical signals from these objects on the screen in their brains. What they watch are the one-to-one copies of their possessions. When you sit by the ocean and watch the sea, the breathtaking scenery actually forms in your brain. That is, you do not see the actual ocean but a copy formed in your brain. The nerves, as with an electrical cable, convey the light rays from the outside to the visual centre in the brain. The scenery, on the other hand, forms in this tiny centre. Yet, there exists not a single light, colour or movement in the visual centre, because the skull is completely insulated from light. Despite this fact, on this tiny and pitch-dark region, we watch a highly detailed, coloured, three-dimensional external world with a quality better than any image produced by high-tech equipment. The blue colour of the sea and the sky, the white appearance of the clouds, the grey colour of the buildings in the distance are all colours produced by the electrical signals in your brain. You can never know the actual colours of the sky, clouds, the sea and buildings. That is because you can never be in touch with their real images. But the image in your brain is so perfect that it is almost identical to the original. That is why, from the moment you are born, you are deceived by assuming that what you see in the external world are the real images. The fact is, however, you are always watching the image formed in your brain. In that case, can you be sure that the real colour of the sea is blue? Or, is it certain that everyone sees the clouds as white and the sky blue, like you do? This is something you can never know, and that you can never learn. That is because you can never step out of the boundaries of your brain and see the actual sky, ocean, clouds and buildings. This is one of the most important facts in your life, and for centuries there has been a deliberate effort to keep that fact hidden. The scientific developments of the 20th and 21st centuries have now made it possible to reveal that fact. Never feign ignorance of this fact, but ponder over it. A person who sits in his house, watching television or having dinner with his family, experiences a great miracle, even though he is unaware of it. That miracle is the fact that the image of four walls surrounding a person sitting in a room is, in reality, within the brain of that person. That being the case, are you in the room, or is the room inside you? The majority of people are unaware of this great truth; they assume themselves to be sitting in a room, watching television or chatting with their family. Those who grasp this fact, on the other hand, pretend not to understand this miracle since they fear it. Yet, this great fact about which they plead ignorance is an undeniable, confirmed one, also revealed by science. Stimuli reaching the eye from the four walls that make up the room, the pictures hanging on the wall, the television, the carpet on the floor, the coloured furniture and the light on the ceiling are transformed into electrical currents by the eye cells. These currents are then transmitted to the visual centre in the brain, and the person watches the image of the house, which he thinks he is in, in the tiny space in the rear part of his brain. At this point, an important question arises: What is it that sees these coloured, vivid images, without the need for an eye, eye lens, retina and iris in the pitch-dark skull? The reason why a person assumes himself to be in a room is the sharpness of the images he watches in his brain and their identicalness to the originals. This is a miracle by itself. A person entering a stadium assumes that he will watch the same game as thousands of other people in the stands. Yet, this is a great delusion. That is because, in the brain of each person in the stadium, there exists a separate stadium, separate players, a separate playground, a separate crowd, in brief, a separate image. Yet, everyone assumes that there exists a single game being played in a single stadium and that thousands of people are watching the same game. Furthermore, they assume that those who remain in their houses are watching the very same game on their televisions. Yet, the fact is that in everyone's brain, copies that are indistinguishable from their originals are created. The number of these copies is equal to the number of watchers. 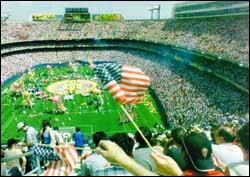 The people in the stadium cannot see the image in the outer world, and neither can those at home see the real image on the television screen. That is because it is impossible for anyone to step outside the screen in their brain and get in touch with the original image outside. The only thing these people can see is their brain's interpretation of the information reaching it. It is the soul that sees. It is, on the other hand, God, the Lord of the entire universe, Who creates both the soul and the images with one-to-one similarity to their originals. What is more, God creates these copies one by one for each and every individual. WHO IS IT THAT LISTENS TO A CONCERT IN THE DEEP SILENCE OF THE BRAIN? The ear captures the sounds around us and delivers them to the middle ear. The middle ear amplifies the sound vibrations and delivers them to the inner ear. The inner ear transforms these sound vibrations into electric signals, and then transmits them to the brain. The hearing process takes place in the hearing centre of the brain. But, who is it that hears? The hearing centre is completely insulated from sound. That is, no matter what the level of noise coming from the outside, the inside of the brain is always silent. But, in this deep silence, we listen to our favourite songs or the concerts of famous bands from the giant loudspeakers placed in a stadium. Have you ever thought who is it that listens (without the need for ears) to the LOUD SOUND FILLING A STADIUM? One does not expect consciousness, understanding and the faculty of appreciation from unconscious flesh, bones and nerves. It is God Who grants "the faculty of hearing and seeing" to your soul, and Who creates you flawlessly. This is a very IMPORTANT and GLORIOUS fact that one needs to ponder. 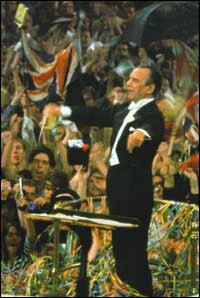 Furthermore, this consciousness can never listen to the original of a concert. It can never hear the original voice of a famous singer. What it hears are the copies of the originals. However, this is such a HIGH QUALITY COPY that one can never distinguish it from the original. Throughout his life, one always thinks that one hears the originals. These sounds that are so realistic are another miracle of God's creation. 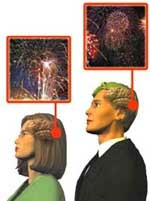 1- What is it that watches in our skulls the electrical signals caused by the firework show? 2- Inside, the skull is pitch-dark and completely insulated. This being the case, what is it that watches this colourful, bright show in the pitch darkness? It is the soul that sees luminous, bright, clear images which possess real depth inside the dark skull. It is the soul that takes pleasure from these images, feels excited in the face of what it sees and thus gives thanks to God, the Creator. The images a man watches in his brain are so clear and real that the majority of people assume they are seeing the original show and fail to notice the miracle. THIS IS A MIRACLE BY ITSELF, BECAUSE, RIGHT AT THIS MOMENT, GOD IS CREATING BILLIONS OF IMAGES FOR BILLIONS OF PEOPLE SIMULTANEOUSLY, AND THESE PEOPLE ARE BEING DECEIVED, ASSUMING THAT THEY ARE SEEING THE ORIGINALS. Pay due attention to this miracle and ponder it deeply. This important fact will enable you to see the miracles in God's creation. The way the human eye functions is incomparably more sophisticated than a high-tech television. The latter consists of hundreds of special components produced in modern labs equipped with special systems. It is the cells made up of proteins and lipids, however, that form the eye. Yet, despite everything, the image produced by a high-tech television is totally inadequate in the face of the image formed by the eye. For this reason, designers and engineers have been struggling for decades to design a television that can produce images with the sharpness of those produced by the eye. Yet, the sharpness achieved as a result of research conducted in giant factories and developed labs still fails to attain the quality achieved by the eye. 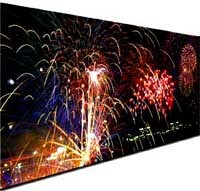 For instance, the image produced by the television is two-dimensional, and only covers certain colours. The cells making up the eye, on the other hand, present us three-dimensional, sharp, colourful images that are INDISTINGUISHABLE from their originals. There is yet another issue that deserves attention, and that is the flawless design in the eye. The duty of the eye cells is to transform the stimuli they receive into electrical signals and to convey them to the brain, where these electrical signals are seen as luminous, coloured images with an impression of depth. However, one needs to keep in mind that the inside of the skull is pitch-dark since the brain is lightproof. In reality, no image forms inside the brain. 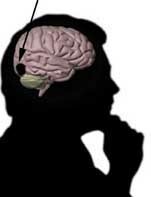 Everything related to the outside world consists of the electrical stimuli reaching the pitch-dark area in our brain. There is a consciousness that perceives the electrical stimuli as desks, trees, the sky, houses, as living and inanimate. The consciousness in question is the soul given to man by God. A person entering a market to do some shopping actually faces a great difficulty, though he is himself unaware of it. - That is because, in this image that he watches on the screen in his brain, he has to manoeuvre through the market. - Meanwhile, while the people he is watching on the screen in his brain are walking all around him, and he must be careful not to hit them. - At the same time, he must select products, the originals of which he will never be able to encounter, from the shelves he sees on the screen in his brain. That is because a person watches every detail regarding the external world only on a screen in his brain. He can never go beyond that screen. Throughout his life, every person only sees the copy images reaching his brain, and can never reach the originals of them. Have you ever thought how difficult it is for a person to walk, run or do the shopping while he is watching his life on a screen in his brain? Yet, God never makes man run up against that difficulty. Furthermore, the majority of people do not even realise that they are watching the world on a screen in their brains. It may well be that you have never thought about this miraculous situation. That is because materialist scientists have tried to hide this fact from people. Only in the 21st century has this miraculous fact been revealed by science. We experience a sour taste when we eat a lemon. However, it is not our tongues that experience that taste, but our brains, which perceive the stimuli reaching them as a sour taste. 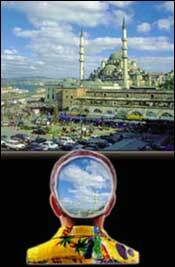 However, our brain never makes contact with the original of what we perceive. That is because what we taste, smell or see is nothing but the electrical signals reaching our brains. 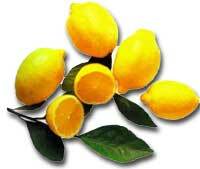 It is the copy of the lemon that reaches our brain. Since we can never make contact with the original lemon, how is it possible that we can experience that sour taste? If the appropriate electrical current with the correct voltage were applied to our tongues via an electrode, we would again think that we were eating a lemon. However, there actually exists neither lemon nor taste. The reason why we experience that sour taste is not because we are in direct contact with the lemon, but because of the brain's interpretation of the electrical current reaching it. We say that the objects exist in the external world, but what if they do not? If we never have the opportunity to test and see those originals, is it not doubtful that their originals do exist on the outside? There is at best a fifty percent chance for both possibilities. So, how can we be sure that the originals of those objects exist? That is one of the secrets of the history of humanity. You first see the round shape of a peach and then notice its bright colour. Then, you sense its hairy skin and pleasant smell and take pleasure from it. When you taste a slice of peach, you sense its taste, softness and smell. However, the peach in your hand is nothing but a copy of the original. It is impossible to see, smell or taste the original of the peach. This is a great miracle, of which people feign ignorance. The taste you experience when you eat the peach is a sensation produced by electrical signals being carried to the brain by the taste detectors located on the tongue. At this stage, one must never forget that the tongue is not the real detector. You think that you experience the taste coming from the original of the peach in your mouth. But, that is a deception. 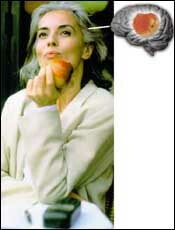 All the information about the taste and appearance of the peach is formed in the relevant centre in the brain. It is not the taste or smell of the peach but information made up of electrical signals that is conveyed to the brain. In the brain, there exists no tongue that can experience the taste. It is the soul that senses the taste of the fruit without needing the tongue and its detectors. All the perceptions experienced by the soul are so perfect that they cannot be distinguished from their originals. That is why people fail to notice this fact at all. It is also a separate miracle that people live without giving a thought to this obvious fact, and totally fail to grasp it. 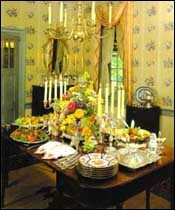 Someone at a party where various kinds of food is served assumes that he is eating the food he sees on the table. That person is, however, mistaken. That is because he does not eat the originals of the food but copies in his brain. It is the brain that tastes, not the tongue or the palate. It is the brain, not the eyes, that sees the colour of the green vegetables and red apples. It is again the brain that smells the odour of delicious food, and not the nose… Everything takes place in one's skull, in that small space. It is impossible for that person to sit at a real table, touch real food, smell real fruit and eat real food. He is only in touch with the copies of the real thing. The main reason why that person is mistaken is that the table in the outside world and the copy of the table formed in his brain are identical. That is why he cannot distinguish the copy from the original. He thinks he can reach the original of everything, but can actually never step out of the boundaries of his brain. This is an extraordinary fact one can grasp by thinking deeply about it. 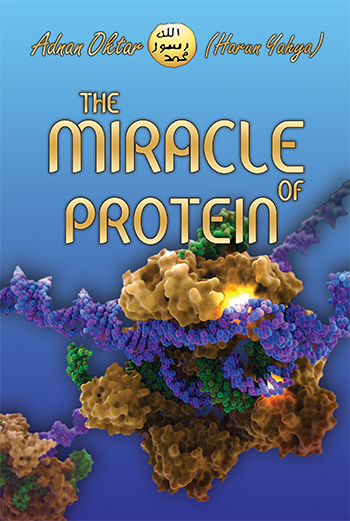 This miracle is, in reality, even available in high school biology textbooks. Yet, people fail to grasp this fact or feign ignorance of it because of prejudice. When we look around, we see everything in our brains. Our eyes and optical nerves, like cables conveying images to a television, transmit the signals emanating from an object to our brains. 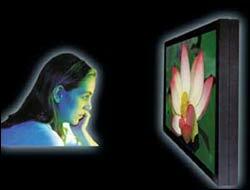 These signals, like the ones we see on a television screen, transform into colored, bright, three dimensional images. We can never see the original objects themselves. For instance, what we see is the copy image of a red rose that forms in our brains. We can never know the color of the original rose. Alternatively, we can never test whether a friend standing next to us sees the rose in the same colors, or whether what we call red is the same color he calls red. That is because in the brains of 100 people looking at the same rose in the same garden, 100 different images of roses are formed. 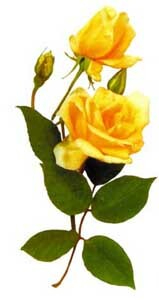 And none of these people can see the original of the rose; they can only see the copies formed in the brain. Despite this obvious fact, people always assume that they touch or smell the original material objects that supposedly cause their experiences. The fact that throughout their lives people assume the images they see are the originals is a miracle created by God. Having a grasp of this important fact and starting to see the miracles of God will change your outlook on life. EVERY EVENT IN WORLD HISTORY IS HAPPENING RIGHT AT THIS MOMENT! 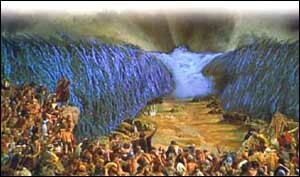 The moment when this picture of the Prophet Moses crossing the Red Sea was painted and the moment when that actual event was experienced are both the same in God's sight. An example will give us a better understanding of this: Assume that you have a picture of a big city spread in front of you. Let's also imagine that there is a man trying to reach from one end to the other end of this city. From the point of view of this man, there is a certain distance to be crossed from one end of this city to another in a definite time. Yet a person who looks at this picture from the outside can see all the details of the city in a single moment. As is the case with this example, while from our point of view we need a certain amount of time for some events to take place, for God, the Creator of time, it takes only a single moment for all events to occur. In the timelessness in God's sight, every instant exists at the same time at the very same moment, and will continue to exist for all eternity. None of the images created by God, no events or beings disappear. (This is similar to the images in a videotape cassette; they continue to exist even after we have watched them.) However, a person has no possibility of rewinding or re-watching them. Only God sees and knows these images in a single moment. Ponder the glorious mysteries and miracles in God's creation, and never avoid confronting the facts. A person who thinks that he has made an intercontinental journey and thus covered thousands of miles has actually not covered even one nautical mile. That is because while he assumed that he was sailing on a boat, he actually watched the journey taking place in his brain. The scenery he enjoyed, the coasts of the various countries, harbors, the way the boat sailed over the ocean, the dolphins and the drifting of the clouds in the sky are all images formed in his brain. When a boat leaves the harbor, the ever-diminishing image of the harbor and its ultimate disappearance from one's sight produce the sensation that the boat is moving. Yet, at that very moment, a person is actually watching the ever-diminishing image of the harbor formed in his brain. 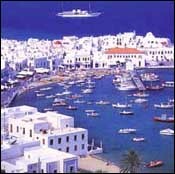 The boat, the harbor and the sky are all images formed in the tiny visual center in the brain. The changing dimensions of the images produce an impression of distance and depth in a person's mind. Actually, there is nothing in the distance; everything remains on a single surface, on one single point. Those who are greedily attached to the life of this world feign ignorance of this fact, and also strive to prevent others from grasping it. That is because a person who accepts that everything he sees is just a copy in his brain will no longer be able to boast about his journeys or the different countries to which he has been. DO NOT FEIGN IGNORANCE OF A GREAT FACT! What feels the thinness of the sheet of paper you are holding, the weight of the bag you carry or the slipperiness of soap is, in reality, not your hand at all. The impressions that come from the objects you touch with your fingertips are transmitted to the brain as electrical signals, and these signals are perceived in the brain as the sense of touch. Hence, when you shake hands with one of your friends, this sensation of shaking hands is your brain's interpretation of certain signals. 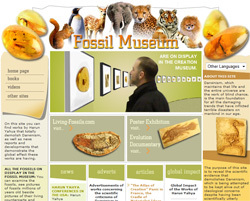 Despite knowing this fact, many people assume that they touch the original of an object. Yet, this is unlikely to happen. A person feels that he is shaking hands with a friend only in his brain. He can never touch the original hand of his friend. What he touches and feels is the copy of his friend's hand formed in his brain. Since we can never reach the original object we touch or see, how can we be sure whether or not this copy is identical to the original? We can never be sure, because throughout our lives we live in our skulls. What we see, touch, hear or taste all exist in our brain. However, as a miracle from God, these copies are so identical to their originals that the majority of people can never realize that fact. Furthermore, one has to make great efforts to convince such people that all they see are illusions and that they can never see the originals. Many people assume that sounds exist in the outer world and that we hear these sounds through our ears. For instance, a person who turns the radio up assumes that he hears a loud sound coming from the loudspeakers. Yet, the fact remains that no sound exists outside a person's brain. The world is utterly silent. In the world outside our brains, there are only vibrations. These vibrations are converted into sounds by our ears and brains. In other words, if there are no ears and brain, there can also be no sound. Furthermore, absolute silence prevails inside our skulls. Even if we accept the existence of sounds in the outside world, these can never reach our brains. What reaches our brain is an electrical copy of the sound. Yet, in this deep silence, man listens to the electrical messages reaching the hearing center of his brain in the form of a loud song coming from the loudspeakers. This being the case, who is it that listens to songs without the need for ears, ear cells or auricles, and who is it that takes pleasure from these songs? It is a person's SOUL. So, as long as there exists no soul listening to a song, there also exists neither radio, nor any machine that makes a lot of noise nor a bell that rings. 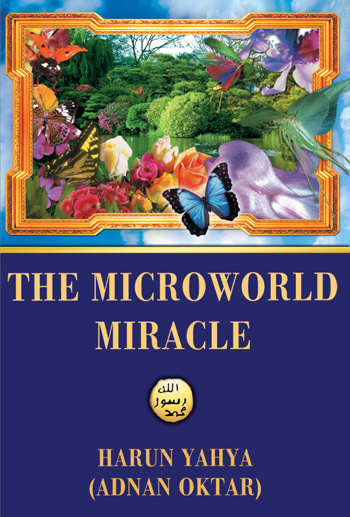 You must think about this extraordinary miracle in God's creation. In a big conference hall, people attentively listening to the speaker assume that they hear every sound uttered by him. In the same assured manner, the speaker expresses his opinions and assumes that the listeners hear him. Yet the facts are otherwise, and at that moment, a miracle of which no one is aware is taking place. 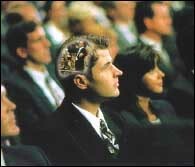 The speaker tells something to the audience in his brain, and in the same manner the audience listens to the speech in their brains. Dozens of people who are sure they are in that hall at that moment actually experience all this in their brains. To have a grasp of this miracle, one needs to have accurate information about the ears, because many people think it is the ear that hears sounds. Yet, the ear only transforms the stimuli reaching it into electrical signals and then transmits them to the brain. These signals are then heard in the hearing center of the brain in the form of sounds. Here, one point deserves special attention. What reaches the brain is not the original sounds but the electrical current that mirrors them; the brain in the skull is completely soundproof. Despite this, in the brain of every listener in the hall, there exists a being that hears the electrical currents as the speech being given. This being experiences everything so realistically that no one can understand that the sound he hears is not the original at all. This being is the SOUL uniquely created by God. Despite the deep silence in the brain, the soul hears everything with perfect clarity. Someone driving a car in heavy rain sees the steering-wheel he holds, the highway he can hardly see and the windscreen-wipers that enable him to see the road all in the very same place, that is in his brain. The stimuli coming from the rain, the asphalt highway and the windows of the car, in brief, all the objects surrounding the driver are perceived in the brain as the rain, highway and car. There is a being watching the outside world from the monitor inside the brain. 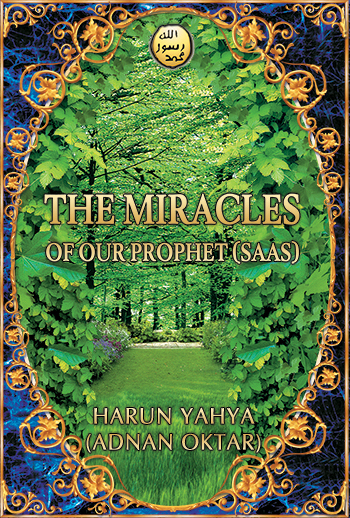 That being is the soul God creates as a great miracle. Have you ever thought how difficult it is for someone who perceives the image of rain from the monitor in his brain to drive without crashing his car? You must certainly ponder over the answer to this question. 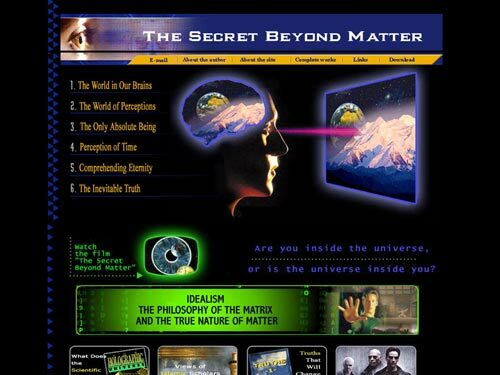 OR DO YOU THINK THAT YOU SEE THE ORIGINAL OF MATTER? The landscape you see when you look through your window alters throughout the year. You encounter a beautiful landscape covered with snow in winter. In springtime, you see a rainy landscape, whereas it changes into a green and sunny view in summer. Have you ever thought where you see these scenes? Has it ever occurred to you that you only watch the copies of the bright sun, white snow or rain that form in your brain? The majority of people over the world do not realize that they see these images in a dark space in their brains, and that they will never see the originals. Yet, this is a scientific fact accepted by the entire scientific world in the 21st century, and which even appears in biology textbooks. Ever since the creation of the world, no one has ever opened his window and seen the original of the scenery outside. Anyone who thinks he has seen the original has, in reality, seen nothing but illusions formed in his brain, and has believed in an illusory object no-one has ever seen. That is because what people call "matter" is, in reality, nothing but the name they give to the illusion they see. The only evidence they offer when they claim that they see the originals outside, is again nothing but illusions. A climber who sits on the peak of a mountain and watches the unique scenery around is often unaware that he sees this marvelous beauty inside his brain. However, this endless image actually forms in the tiny visual center of the climber's brain. What he sees, on the other hand, is nothing but his brain's interpretation of the rays reaching it from that scenery. In other words, he actually sees a one-to-one copy of that scenery made up of electrical signals, rather than the scenery itself. Owing to this similarity, the climber thinks he is face-to-face with the original scenery outside. He believes that matter exists externally. And he is free to believe this. However, he must never forget that since time immemorial, no man has ever seen the original of matter, and that he is claiming to see something that has never been seen by anyone. The only evidence he has is the illusion formed in his brain. DID YOU KNOW THAT THROUGHOUT YOUR LIVES YOU LEARN NEW INFORMATION BY READING THE BOOKS IN YOUR BRAIN? Did you know that the story books, textbooks, encyclopedias, novels, in brief, all the books you have read since your childhood are, in reality, copies of books formed in your brain, and that you can never step out of your brain and read the original of a book? The hand you place on a book, the book itself and the desk are all formed in the visual center in your brain, all in one single place. Yet, the image formed in the brain as a result of the electrical signals coming from the book are so clear and real that you cannot grasp that fact. You think that you see and that your hands hold the original book. Yet, you forget the fact that it is another being that reads, understands and learns the content of that book, which is formed in the tiny visual center in your brain. Many people are unaware that the being that follows these lines without the need for an eye is the soul given to man by God. Those who are aware, on the other hand, try to avoid this awesome truth. Those who ponder this established fact and the existence of soul, and thus who refuse to avoid the facts, will always benefit greatly. For those who start to have an understanding of God's might, the world will have a brand new meaning.